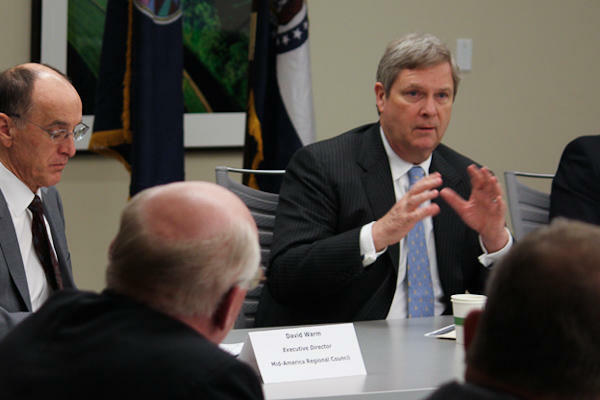 Agriculture Secretary Tom Vilsack, speaking at a roundtable in Kansas City last week. I started out by noting that while the president discussed manufacturing and energy at length, he otherwise made few direct references to rural America or agriculture in his speech. Q: Do you think rural issues are taking a back seat in this election year? A: Not at all, not at all. Manufacturing that the president was talking about, occurs very, very frequently in small towns. So when he talks about increasing manufacturing, he's really talking about creating opportunity in rural areas. A good example of what the president is talking about is what agriculture itself has been able to do. It's become more productive over the course of the last 30 years. Ag. is the second most-productive aspect of our economy. And that resulted in record income levels for farmers last year, and an unemployment rate that's going down at a faster rate in rural America than elsewhere. So when he talks about manufacturing, when he talks about infrastructure, he's talking about rural America. Q: And in rural Missouri, the USDA recently announced the closing of ten offices. That's part of a larger closing of more than 200 offices around the country. You've said that won't disrupt service, but I've heard some farmers are concerned that driving extra distance to the next closest office isn't always realistic. What's your response to those concerns? A: Well, we basically followed the direction and guidelines established by Congress, in trying to determine how best to deal with reductions in our budget. We received over the last two years a 12.5 percent reduction in our budget. The Farm Service Agency in particular has seen their workforce decrease by nearly 6,000 over the past ten years, about a third of their workforce. So naturally, if you have fewer dollars and fewer workers, and more work to do, you've got to figure out ways in which you can continue that service, but you may have to do it in a slightly different place. Q: In January, the agriculture department also announced more money for disaster assistance, and the biggest chunk of that was $14 million, which is going to Missouri for flood recovery. Do you think there's a way to prevent these huge losses to farmers in the future, especially if crop insurance subsidies end up getting reduced in the next farm bill? A: The goal here I think is to create a safety net that provides help and assistance to farmers when they need it, and provides help and assistance to farmers who need it the most. So I think you're going to see a change in the system we have today which provides payments to farmers whether it's a good year or bad year. I think you're clearly going to see a change in that system. Fiscal circumstances are going to dictate it. I think it's going to be important for us to continue providing crop insurance because that's the principle risk-management tool that's successful, particularly in the Midwest. There may be some commodities where that system won't work, so Congress may have to create some modifications or adjustments, but at the end of the day, I think that's kinda what you're looking at.